In Barbados, we are lucky to enjoy one of the best tropical climates in the world — warm and sunny just about all year round! With these warm temperatures, finding an effective and affordable air condition system in Barbados is essential. When it comes to air conditioners there are many options to choose from, as well as plenty of factors to consider. One type of air conditioner, however, is starting to gain popularity and becoming the preferred choice for many homeowners. And, these types of units are reverse cycle air conditioners. Unlike standard air conditioning units, a reverse cycle air conditioner can both cool and warm your home. These air conditioners use a refrigeration cycle to cool the inside area of a home, and a reverse cycle to warm it up. To heat your home, a reverse-cycle system extracts heat from the outdoor air, even on a chilly night, and draws it inside. The unit’s refrigerant is passed through an external coil, captivating the heat from the air. Then, the refrigerant is pumped by the unit’s compressor, passed through the chambers, down into the condenser. As the refrigerant is compressed, it eventually warms up. Thus, hot air is created and pushed out by a fan filling the area with warm air. Although heating isn’t necessarily a necessity in Barbados, it can certainly come in handy on during those chilly nights and mornings! On the other end, when the process is reversed, instead of blowing warm air into a home, the unit effectively fills an area with cool air to help homeowners stay cool during those hot summer days. While reverse cycle air conditioners generally cost more to purchase than an evaporative air conditioning unit, they do offer a variety of benefits. These systems are arguably one of the most effective systems for residential climate control and gives homeowners the option to either heat or cool their home. Many reverse cycle air conditions now include inverter technology, which enables reverse-cycle units to operate much more efficiently than standard AC units. These units can automatically adjust power in order to reach the desired room temperature carefully and maintaining it steadily as long as desired. Units with this modern technology are able to self-adjust power requirements, making them a more economical choice over conventional units. There are many benefits of choosing a reverse cycle air conditioning unit. While the use of heat isn’t a priority in an area like Barbados, the other benefits that come with these units are why so many homeowners find them appealing. Check out a few. Reverse cycle systems are more effective and efficient at cooling homes than most people think. These systems use a highly energy efficient system that allows the unit to extract heat from the inside air and depletes it outside. And, with today’s modern technology, a reverse cycle air conditioning unit can effectively cool homes, even in temperatures as high as 46 ºC! So ditch the embarrassing and bulky fans, this is an effective cooling system, perfect for a hot climate like Barbados. Just with the flick of a switch, a reverse cycle air conditioner can be changed to heating mode. As mentioned, a reverse cycle air conditioning unit is different from standard air conditions in that it has the option to heat in addition to cooling. And, these units work much differently than conventional gas heaters, portable electric heaters, or space heaters. While conventional heaters create heat energy, a reverse cycle unit absorbs the heat, extracting it from the outside air, which is a much more energy-efficient process. And, because these units were designed with cooler conditions in mind, most reverse cycle units will have an automatic defrost cycle for more effective operation, a feature that isn’t necessarily needed in Barbados but is useful for many homeowners. One thing you will probably hear, and appreciate, is that reverse cycle air conditioning units are extremely efficient. And, when we say they are efficient, we are not only talking about energy efficiency, but at overtime cost, as well as heating and cooling, too. In fact, these units are becoming more and more efficient, especially in terms of energy usage and cost. With the electricity prices showing no sign of lowering, having an air conditioner that is efficient is becoming extremely important, especially if you live in a climate that is constantly hot. And, even in the most extreme conditions, the units will maintain their efficiency — for example, one kilowatt of energy consumed will generate three times the kilowatts in cooling. More efficient than portable heaters. Many homeowners who may not need an entire heating system may instead opt for a portable heater, which can often be cheap and costly to run. Plus, considering the size and space of an area that a space heater is being used in, a portable heater may not get the job done. Portable heaters are meant to heat a small area — enough to warm a person’s surrounding environment. However, for those looking to heat an area of a home, a reverse cycle system is much more efficient than a portable or electric heater. Because these units boast energy efficiency, many recent reverse cycle air conditioning models will feature built-in thermostats and innovative inverter technology, enabling the unit to adapt to the temperature and the condition of a room or area. Inverter technology helps these units carry out one of the most energy-efficient ways to cool or heat a home with electricity. Compared to conventional units on and off operation, units with inverter technology carefully adjust power to reach the desired temperature quicker, then steadily maintains it without fluctuations for an uninterrupted comfort and more efficient operation. One of the best advantages of reverse cycle air conditioning installation in Barbados is that you only have to pay once for a unit that carries out two functions. All that is needed is a simple switch between modes for cooling during those hot summer days and heating to occasionally add a bit of warmth to the inside environment. Installing a reverse cycle unit is a sure way to make homeowner’s heating and cooling expenses much more efficient. If dust, smoke or fog is an issue, a reverse cycle system can be an effective solution to eliminate it. These systems not only heat and cool inside areas, they can actually help purify them, too. Many units include built-in air purification filters that trap microscopic airborne particles, improving the quality of indoor air. Some units even have the ability to eliminate odors and can absorb bacteria and viruses! For those who have really bad allergies, adding a reverse cycle air conditioning system can help improve the air quality in their home. Not only does this system create a comfortable environment by achieving the desired temperature set, climate control is not the only thing contributes to a comfortable living area. Having a loud and bulky air conditioning system can really make a home uncomfortable and unbearable space to be in. With this in mind, reverse cycle systems were designed to reduce operating noise while still efficiently cooling an area, maximizing a homeowner’s comfort level. When purchasing and installing a reverse cycle air conditioning system from the right company, homeowners will likely have professional help on the optimal cooling solution. And when it comes to air conditioning installation in Barbados, hiring a professional is always a good idea. Every home is different, so a specialist can evaluate your needs and desires and suggest the most appropriate cooling solution, ensuring that homeowners receive a top quality product that performs efficiently and effectively thanks to professional installation and support. Interested in reverse cycle air conditioning in Barbados? 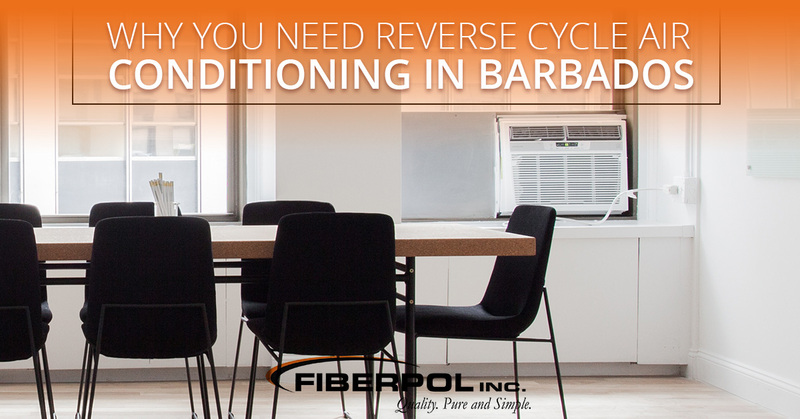 If you live in Barbados, the cooling features of a reverse cycle unit may be appealing. 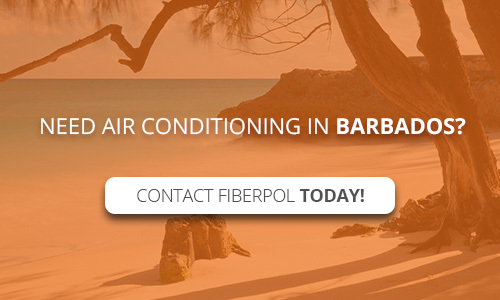 If you are in need of an air conditioning unit in Barbados, be sure to contact Fiberpol! At Fiberpol, we carry Streamline Air Conditioners, including a reverse cycle system with inverter technology! We also carry standard AC units, too! Our units are sleek, quiet, and effective at creating a cooler, more comfortable space. The only way to beat the Barbados heat is by contacting Fiberpol for some of the best air conditioning units in the area!